Irresistibly light and sweet cotton candy is sure to draw a crowd of customers at your concession stand, fair, or midway. Keep up with the demand and produce 60-70 cones with one 1/2 gallon carton of this Great Western blue raspberry floss sugar cotton candy mix! Unlike floss sugar concentrate, this cotton candy mix is ready to pour directly into your cotton candy machine. With no mixing required, this pre-mixed product contains a premium blend of sugar, raspberry flavoring, and blue coloring. Its eye-catching blue color offers a classic look, while its raspberry flavor adds just the right amount of fruity sweetness. Since pink strawberry and blue raspberry are such widely loved cotton candy flavors, your customers won't be able to resist! And when you're changing cotton candy flavors and colors throughout the day for eye-catching displays, you can reclose the easy-to-store floss sugar carton to keep the product fresh. Great cotton candy. Light cotton candy with loads of flavor. I made this for a carnival birthday party and even with some kids coming back several times, I only used half the carton. A little goes a long way. We use all the different Great Western cotton candy floss sugars sold here on Webstaurant. The kids love them. Quality seems to be high and the price is right. This makes great cotton candy, very bright color and perfect for any machine, cannot go wrong with this product. One box makes a lot and is well worth the money. This floss had an excellent taste and flavor. Our customers wanted to know where we bought it. We will use this brand from now on. I love the awesome quality of the Great West cotton candy floss and the blue raspberry is a great seller. The blue raspberry flavor is bold and very sweet. This cotton candy floss sugar is the best smelling, best tasting ive used over other brands! it comes out perfect with the cannival king machine and doesnt go bad! This blue raspberry sugar floss tastes great! It makes a bunch of cones. Even when you make them BIG.. it has a gorgeous color blue that attracts the eye and smells great too. I love that its ready to use. Just pour and scoop right into the machine. Have ordered Great Western Blue Raspberry for a while. Its Easily portable, pours great and kids love it. Its a tasty classic and always increases sales. Blue Raspberry is probably our #1 seller, because of it's bright color, and because it's traditional, but it's flavor is very tasty, so it always brings kids back for more! This stuff is awesome, the color is great and flavor even better. This didn't disappoint at our wedding and was easy to use. Kids and adults will love this plus the price is great for the quality. This blue rasberry was everyone’s favorite flavor in the cotton candy. This was also a big hit at our VBS kick off. The amount Of cotton candy that each container made went beyond my expectation. We will definitely be ordering again! Got this flavor in the mail today, heated up the machine and spun some cotton candy for my kids. Their blue faces made my day. I missed the opportunity to capture the moment to show their delight. As good as the kind you can purchase at the fair! Purchased to make cotton candy for a huge event. It will make a ton of servings. This is a great tasting product and very easy to use. We made over 3000 bags of cotton candy to serve at out city Fourth of July Celebration and it was a big hit. The half gallon carton of floss works great for small events. Premixed and ready to go. No mixing or having to worry about extra supplies. It tastes great and the color is good. Great Western makes a really nice line of cotton candy sugar floss. The floss is perfect and works well with our machine. The blue raspberry is bright blue and has a sweet, tart flavor that kids love. A great buy and fast shipping. Who doesn't love a blue cotton candy tongue? The flavor is nice and strong enough that it's not just sweet. You can actually taste the raspberry! The aroma is vary nice also. It's a favorite! Honestly you can never go wrong with Blue Rasberry; but I find that this brand tastes better than their competitors. It's also great to mix with other flavors. Blue raspberry is always a hit. Made my carnival event so fun. It tastes like my childhood and everyone enjoyed it. I like the carton too easy to pour. Great Western is a great cotton candy floss. The sugar melts really well and spins into great tasting cotton candy. The blue raspberry is a great flavor and a great color. This was a blast to make at the birthday party! The kids loved making cotton candy cones though out the night. It was definitely the talk of the party that night! Greatly exceeded my expectations!! I am obsessed with this blue raspberry cotton candy. It has the best flavor and the colors are so vibrant. It's so soft and melts in your mouth. I have every flavor and love each one! Great taste I like children love this. I recommend and this is available in great value price thanks webstaurant store for sale this product five stars. This is probably the most eye-catching of the flavors I purchased. Blue and pink colored candy are the two primary colors most people associate with cotton candy, and the blue raspberry variety is the perfect shade of blue. The blue outsold the pink in my experience, and complements the display. Great flavor and lasts forever! We got this for a special event and will be ordering again in the future. Kids and adults alike love it and the flavor is popular. Top quality Cotton Candy..... great blue raspberry flavoring, I purchased way to much as usual and still haven't used it all, but it makes alot of cotton candy. This sugar is one of our favorites just because of the pretty blue color that it spins out into. We love to mix it with other colors and it tastes good too! The Blue raspberry cotton candy floss sugar comes in the ideal size container to be able to store and use in a small restaurant like ours. Customers love it! This preflavored cotton candy mix is super easy to use. No measuring or mixing required. Simply spoon into your cotton candy machine and watch the magic. Tastes great too! Amazing texture and flavors!! One of my best selling and a little goes a long way. Very soft and fluffy. Never once did I have a problem with it. Must have cotton candy! Smells and tastes great and the kids love it! Also purchased cotton candy bags and pink floss from this site as well. Awesome cotton candy flavor! Our customers love the Blue Raspberry Cotton candy. The floss pours easily and works great in our machine. Recommend to anyone. Delicious cotton candy flavor! By far our favorite of all we've tried. Each scoop makes one large cone or two small cones. Will turn your teeth blue, but fantastic taste! Blue raspberry is a popular candy flavoring. It has a sweet and sour taste to it and fun blue color. This is yet another good product available at a bargain price. It isn't the highest quality floss. The grain of the sugar is very coarse but it will spin into cotton candy. Blues raspberry is the most popular flavor I currently have. OH my Goodness! This product was such a big hit for our sport teams fundraiser! The kids and adults too all loved this Blue Raspberry flavor!!! We sell cotton candy at every PTA fundraiser and it's always a hit. The Blue Raspberry flavor is one of our best sellers. The kids love it. I bought this flavor for my new vivo machine & my Grandkids love it! It has a pretty color & an excellent flavor! Very fluffy & great tasting. I recommend this product. Excellent purchase. Extremely pleased with product thus far. Will purchase item again in the near future. Will be using for a family reunion carnival fun day. Makes great blue raspberry cotton candy. Very good and pour the sugar in the machine turn on the heat and in no time this will ale blue raspberry flavored cotton candy. I purchased a small cotton candy machine for my home. This sugar worked great in this little machine. The taste is great and you can't beat the price. My grandson loves having our very own machine. Number one selling cotton candy flavor for us. Blue Raspberry fluffs the best making giant cones which kids LOVE. Best value on sugar floss for sure. Love the bright blue color, and the favor is amazing. Not your average carnival cotton candy, it's WAY better. One scoop makes a lot of candy. My customers favorite flavor. Everybody loves this Cotton Candy, and it's taste. it is a huge hit at our concession at our petting farm and it was a lot cheaper to buy here than to buy it local. I do plan on purchasing more and getting more of a variety of flavors. I would recommend this product to anybody. my family loves the taste of this sugar. the price compared to the price around home I can get case for the price of a small bottle. :) great stuff. Great Flavor, I loved this sugar for my candy cotton. The shipping was very fast, and at this moment i have this product in Colombia - South America. I will buy in this page, I loved it and have very good prices. This is the most delicious cotton candy flavor of all! We sell Blue Raspberry 2 to 1 of any of the other flavors. Definately a favorite! I have been so impressed by how quickly your company ships! This cotton candy sugar was very yummy our kids at the carnival loved every bite, was a great deal and will order more this year. This blue raspberry cotton candy sugar was great! It was an excellent value. Tastes just like the carnival. Everyone at the events were raving about the delicious taste. This floss sugar came wrapped in a plastic bag in case of damage. The flavor was very good and it spun well. I would definitely order again. I run a bakery and I am always experimenting with new desserts and fillings. It's important to me to obtain true flavors in baking, and when I was searching for the perfect sugar to make cotton candy dessert, this popped up! Love it! Amazing! Flossed up beautifully and was nice and fluffy even in an inexpensive machine designed for home use. Smells amazing when it starts to melt! Since my daughter got her Christmas gift last year, I had a hard time to find sugar for it, I was so happy to find here,that is a lot of Floss Sugar :) We've made many times cotton candy, but still a lot left, good price , good taste! This product was good. I especially loved the delivery service, which made our event a tremendous success. I look forward to making my next purchase from Webstaurant. Thank you. This sugar was some of the best I've used so far in making cotton candy. The blue was by far, the most popular. I'll be sure to reorder soon! This cotton candy sugar is the best sugar I have found. 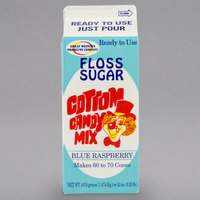 I have been looking for a good sugar for my nostalgic cotton candy machine and this product is fantastic. I love this floss sugar! The carton is easy to store, which is great. The color comes out great and has a wonderful flavor to it.